Vinyl liners enhance the beauty of the pool, affecting the color of the water, while providing long term cost efficiency. Spill-over hottubs, slides, islands, and other custom features will make your pool unique. SAVE if you have the resources to provide your own electrical or cement flatwork. We'll work with you! Your pool is an extension of your home. At Campbell Pools, LLC, we create custom pools for every budget that reflect your style while you enjoy the outdoors. A steel walled pool gives you the most flexibility for custom options, shape, strength, and long life, making your pool a perfect addition to your home. Confident that our work is solid and that you will love every detail, we provide a workmanship guarantee. Ask us for details. 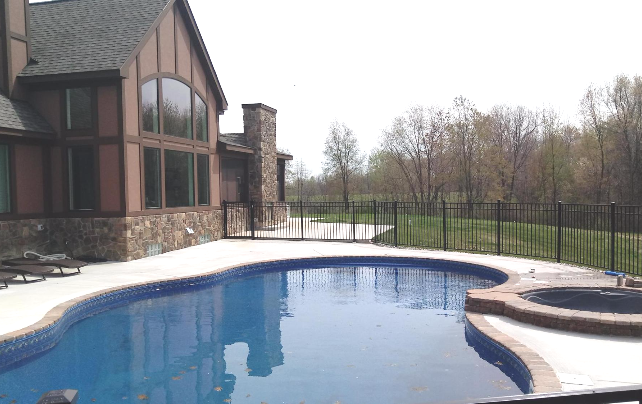 Based in Clio, MI we are an independently owned custom in-ground pool company, proudly serving homeowners from Midland to Oxford, and around the greater region. For more than 30 years we have designed and built custom in-ground steel wall / vinyl lined pools of all sorts, putting our heart and soul into every last detail. Fully insured and bonded, we are your preferred pool designer and builder. We love our work, you will too! WE LOVE OUR WORK, YOU WILL TOO!